E3 Recruitment (E3R) is delighted to announce it is a headline sponsor of Bradford Manufacturing Week, an initiative which aims to create 6,000 student manufacturing experiences in Bradford, which educates young people about career opportunities in the manufacturing sector. Bradford Manufacturing Weeks, which celebrated a highly successful inaugural campaign in 2018 after creating 3,000 manufacturing work experiences during one week for young people in the district, has announced it is extending to a two-week initiative from 7-18 October 2019. E3R which specialises in manufacturing and engineering recruitment, got involved with Bradford Manufacturing Week last year as it is passionate about closing the skills gap within the industry it serves, and delivered a number of assemblies to young people advising them on the opportunities and careers that are open to them. Led by West & North Yorkshire Chamber and delivered in partnership with Bradford-based school and career specialists Aspire igen – with other primarily Barclays – Bradford Manufacturing Weeks 2019 aims to double involvement from the 44 manufacturers who took part last year and reach three quarters of the district’s 49 secondary schools. The brainchild of Nick Garthwaite, president of Bradford Chamber, chairman of the Bradford and Airedale Manufacturing Alliance (BAMA) and Managing Director of international chemicals and detergents manufacturer Christeyns, Bradford Manufacturing Weeks is designed to create more inspired, informed and ‘work ready’ applicants into the sector. This year the initiative will include events to support the district’s current apprentices alongside a new Apprentice Live panel offering pupils the chance to quiz local apprentices, Qs and As with manufacturers and a series of ‘getting to know you events’ for schools to network with employers as well as the popular manufacturer tours, work placements, work experiences and careers workshops. Nick, who this week met sponsors, students and apprentices at Bradford aerospace manufacturers Produmax, to kickstart six months of awareness raising, believes the initiative is already strengthening employer and school relationships. He said: “Last year, one week in Bradford created 3,000 manufacturing experiences for local young people from work placements and factory tours to work experiences and Barclays Life Skills workshops. 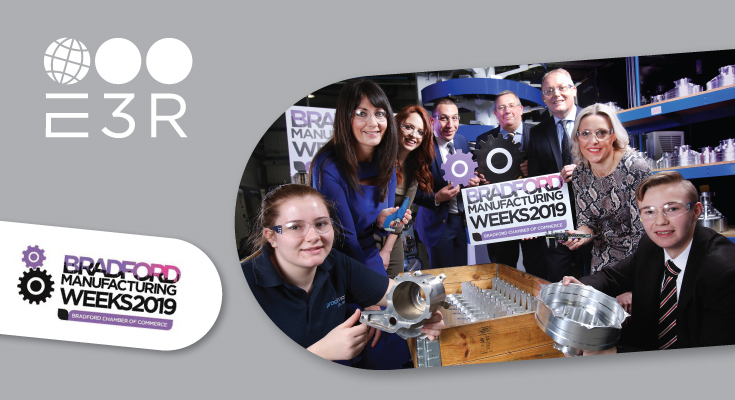 Bradford Manufacturing Weeks 2019 already has support from some of Bradford’s major manufacturers including Carnaud Metalbox, Acorn Stairlifts and Solenis and is backed with further sponsorship from Gordons LLP, Naylor Wintersgill, Bradford University and global training provider Dale Carnegie. It will complement the Leeds Manufacturing Festival, an initiative co-ordinated by Leeds Chamber of Commerce and Leeds Manufacturing Alliance which also aims to showcase career opportunities to young people. Andrew Joseph E3R Director commented on why E3R has chosen to be a sponsor of this initiative: “E3R’s passion to help bridge the skills gap was founded from the Directors personal experience back in 2013, when seeking careers guidance for their children who were exploring the options that were available to them when leaving school. It was during this process that we discovered the void around schools and students’ knowledge, based upon the career opportunities that can be associated with a career in manufacturing. Simon Clemmett, STEM and F1 in Schools Lead at Hanson Academy whose student Ben Bott (16) was one of a number to visit Produmax as part of Bradford Manufacturing Week last year, said Ben was delighted to return this week and help announce the 2019 initiative. Bradford district is an economy built on manufacturing with 1,200 businesses employing 27,000 people – 13% of all employment compared to just 8% nationally and the fourth highest of any city district in the UK . Engineering is the district’s largest manufacturing sector, which also includes chemicals, food and drink and textiles. Photo caption: Gathered at Produmax to mark the build up to October’s Bradford Manufacturing Weeks 2019 are (back left to right), sponsors Alex Fogal, Barclays; Kirsty Tagg, Dale Carnegie; Andrew Joseph, E3 Recruitment; Nick Garthwaite, Christeyns; Paul Young, Gordons LLP and Vicky Wainwright, Naylor Wintersgill. Front left: Produmax apprentice Jasmine Hibbert and Ben Bott, pupil of Hansen Academy.